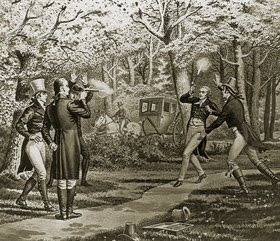 Early American political bloggers Aaron Burr and Alexander Hamilton were active participants in a polarized political discussion. For political bloggers and readers, there are few things as interesting as an analysis of umm... political bloggers and readers. In recent weeks three studies have been getting attention from bloggers, focusing on the polarized political web, polarized political book buyers, and polarized political blog readers. "Our new map... will reveal:- the 500 most influential websites of the U.S. political webosphere;- the newcomers to this online territory;- the locations of the candidates’ websites;- a refined categorisation of websites that abandons traditional media categories (Mainstream Media vs. Social Media) to offer an accurate view of this territory as one of mainly partisan websites..."
The map is automatically generated based on links between political websites, and includes news organizations and candidate websites as well as blogs. However, the website labels (conservative, progressive, independent) are manually assigned, which introduces opinion and the possibility of bias and distortion in the graphical display. It also certainly gives short shrift to independent and centrist blogs (Moderate Voice and Andrew Sullivan are labeled as Progressive, Memeorandum and Cato are labeled Conservative and the only sites to be labeled Independent are Roll Call and FactCheck.) The bias against Independent/Centrist blogs may be an artifact of their selection algorithm which determines influence by mutual links. One might posit that Independent/Centrist blogs will link to partisans of both sides, but partisan blogs of either stripe are less likely to find independent blogs worthy of links. The study is also sadly deficient in that DWSUWF is inexpicably not included in the data or the map. Still,the partisan polarized nature of the political blogosphere clearly emerges in the map and the interactive nature of the presentation makes it the coolest of the three studies and the biggest potential time sink. "In the past we saw a divided nation in our book buying data. We saw then a distinct red cluster and a distinct blue cluster with very little holding them together in terms of cross-links or books in common. 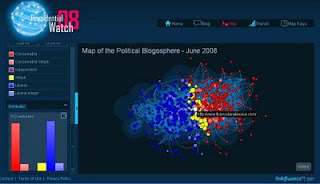 Now, in June 2008, after the major party candidates have been selected via the long primary season, we again probe the predictive patterns of political polemics..."
We learn from Vladis that there is as pronounced a clustering in 2008 political book buyers as there was in in 2004, but with a wrinkle. While the polarized clusters are similar, they split on a distinctly different fault line. 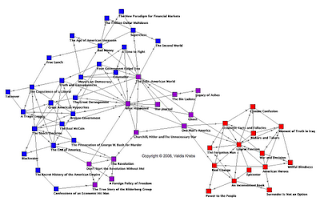 In 2004 book buying patterns clustered around a traditional red/blue Republican/Democrat fault line. This year the cleanest split is between the books that are for and against the War in Iraq. "...we find strong evidence of polarization among blogreaders, who tend to be more polarized than both non-blog-readers and consumers of various television news, and roughly as polarized as US Senators. Blog readers are also substantially more likely to participate in politics than non-blog readers. However, in contrast to previous research on offline social networks, we do not find that cross-cutting exposure to blogs of different ideological dispositions lowers participations." "... there is a general tradeoff between deliberation and participation among blog readers, an increasingly important group of highly politically aware individuals. Blog readers are more likely to participate in politics than non-blog readers, but also very likely to read only blogs whose political leanings accord with their own." "After all, we’re a polarized polity right now, so it stands to reason that we’d see the same in the blogosphere. 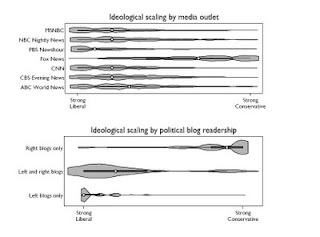 Given that the mass media outlets to which blogs are compared in the chart above are ostensibly “neutral” whereas the blogs are openly biased, it’s remarkable how polarized the audiences of the former are." I agree with Joyner that the blogosphere is a reasonable reflection of the political sphere at large, so the finding that political blog readers (like political book readers) are also polarized is perhaps a blinding flash of the obvious. Still, the degree to which blog readers are polarized is surprising, as the authors find that 94% of blog readers are classified as "Carnivores" seeking primarily sites in agreement with their views, leaving only 6% omnivores that seek a more balanced diet of political perspective. Joe Windish at The Moderate Voice worries in "Study: there aren’t many blog readers in the ideological center" that this polarization "makes us a niche read here at TMV!" I am among the 6% omnivores as I do read blogs from both the right and left. However, as some of the Crooked Timber commenters point out, the source data is from 2006, and the results could be highly time and context dependent. 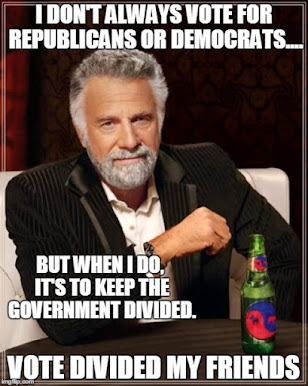 Since I advocate for divided government on my blog, in 2006 I spent more time flocking with left of center blogs who at the time were big fans of the divided government meme. Now, not so much. I find myself now spending more time on right-of-center blogs, who are in the midst of an epiphany about the wisdom of voting to maintain divided government into 2009. Funny how that works. Andrew Sullivan at The Daily Dish laments the author's findings in "Bloggy Homophily" saying "A new study of blog readers finds a depressing amount of polarization..."
Different self-selection and organizing principles, but the more things change, the more they remain the same. 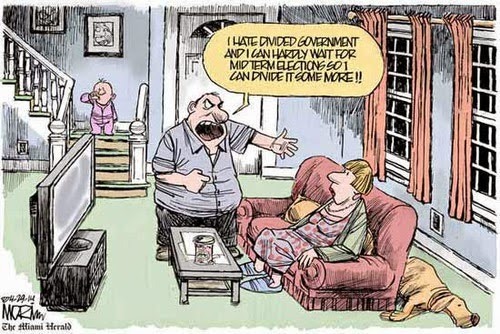 Point being, when you lament political polarization, you are lamenting political participation. In American politics, polarization and participation are not just linked, they are one and the same. When you argue against "bad" political polarization, you argue for decreased political participation - you argue, in effect, for political apathy. NOTE: The title of this post is DWSUWF Rule #1 (we never got around to writing rule #2), cribbed from the last time that DWSUWF was compelled to rise in defense of the great American tradition of political polarization: "Fellow travellers Tony Snow and David Gregory promote Un-American activities."